Locke and the others come up with a plan to get Jack away from the Others. They wait until night and then Kate sneaks into Jack's house, but the Others are watching Jack and capture her. Locke on the other hand goes into Ben's house and holds him at gunpoint, looking for the submarine. Ben figures out that Locke is planning on destroying the sub, not taking it. Kate's holed up in a rec room, and Jack visits her to let her know that they're letting him leave the island. Locke has Alex lead him to the submarine. 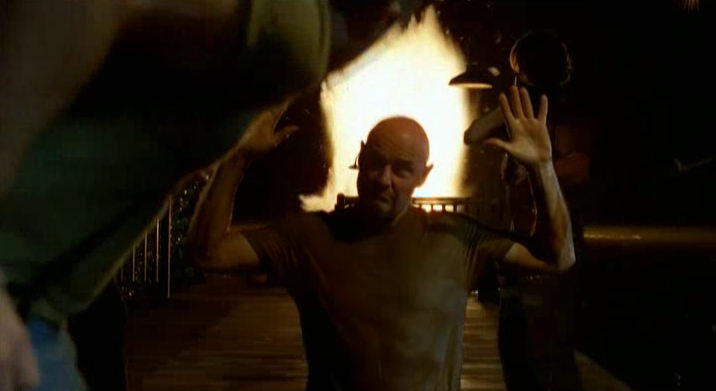 As Jack and Juliet are brought to the sub to leave the island, the dynamite that Locke planted in the sub goes off and it blows up. Locke is taken captive by the Others, and Ben begins his mind games with Locke, since he realizes that there's something special about Locke and the island. He shows Locke his father, who was brought to the island by the Others and is being held hostage. With Ben planning on taking the Others and leaving the barracks, he's set on letting Jack, Sayid, and Kate go, and is leaving Juliet with them as well, although he's having her work undercover for him while she goes back to their camp (Side note: this conversation was taking place as a flashback while they showed Juliet integrating with the Losties' camp, so the video had to fade to black for part of the conversation, similar to when Desmond first met Penny outside of the monastery). On the freighter, Michael meets Keamy and his pack of mercenaries, even though he thought this was supposed to be a rescue mission. He heads down to his room and pulls out the suitcase that was given to him, that contains explosives to blow up the freighter. He tries to set it off, but is given a message telling him not yet. Ben calls the ship and tells him he can't blow up the ship because there are innocent people on there that shouldn't have to die. He has Michael get a list of the passengers on board, and sabotage the radio room. Back on the island, Nikki discovers Paulo's nicotine gum and realizes he found their satchel with the diamonds and had been hiding it from her. She takes him into the jungle and when he won't give her the diamonds, she throws one of Dr. Arzt's Medusa spiders onto him, which paralyzes him. Only he kills the spider, which causes its pheromones to release and attract other Medusa spiders. One of them bites Nikki, and she runs away, hides the diamonds in the dirt, then runs to the beach where she collapses in front of Sawyer and Hurley, who think she's dead. The episode runs 50:10 and is 392MB to download. You can stream the episode below (via Facebook), or go here to use torrents (better quality, recommended) to download the episodes to your computer. wow, some continuity errors really become apparent in chronological viewing.. tom said ben couldn't get surgery off island because the failsafe event knocked out their communications and submarine beacon, yet he's able to run off-island to recruit michael and presumably pick up anthony cooper. ben is also able to radio the freighter despite supposedly having no communications at this time. you could make a case that they were lying about not having communications, but it still doesn't explain why ben wouldn't just go off-island for surgery. conversely, it's really awesome seeing the freighter story intercut with the events of season 3. 'kevin johnson' was my least favorite episode of s4, but broken up into the timeline it works much much better. @joelarue - Good call on the continuity errors, I guess it's tough sometimes to keep everything in order. Agreed on the freighter story, definitely works a lot better cut up and inserted into the present story line. you know I never realized the whole Anthony Cooper thing, I always had that as one of the real unsolved mysteries of the island - the magic box where Locke's dad magically appeared. Seeing it in this sequence and reading joelarue's comments gives it a perfectly logical explanation! He came on the Sub with Tom!